Heat oven to 350° F. Grease a mini muffin pan with cooking spray; set aside. In a medium bowl, whisk together the flour, cocoa, baking powder, and salt; set aside. In a large microwave-safe bowl, combine the butter and butterscotch chips. Microwave on high in 30-second intervals, stirring between each, until melted and smooth. Let cool slightly. Whisk in the sugar, eggs, and vanilla into the melted chocolate until smooth. Add the flour mixture and mix until just combined - do not overmix. Fill each mini muffin well about 1/2 way full. Bake in preheated oven for 10-15 minutes or until the center comes out clean. Remove from oven and immediately (yet carefully) and press the center down of each brownie button to make an indention. 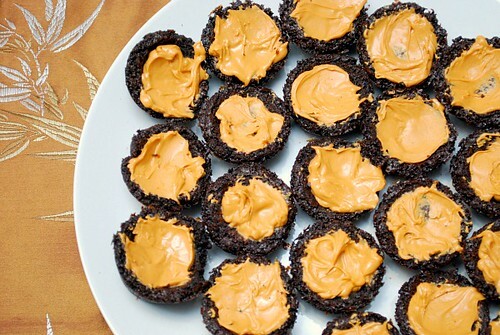 While brownie buttons are still warm, add a few butterscotch chips and allow to sit untouched, to soften. 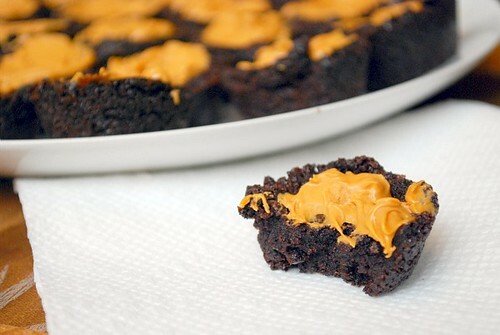 After a minute or two, spread the softened butterscotch chips to frost the tops of each brownie button. Carefully pop out each brownie from the well and serve with a tall glass of milk. Love the look and sound of these! I agree that butterscotch chips live in the shadows, but they are so delicious! Oh my goodness,these look amazing!! I cannot wait to try this recipe out, yum!